"You have contributed to each and every one of us — with dedication and generosity and enormous linguistic talent — to our thinking, to our work, to our attitude toward doing science in general. Thank you." More than 100 faculty colleagues, current and former students, and guests gathered at the Stata Center on February 11, 2017 for a daylong linguistics workshop organized as a tribute to the research and teaching of MIT linguist David Pesetsky. Attendees came from as far away as Korea, Russia, and Turkey to honor Pesetsky, the Ferrari P. Ward Professor of Modern Languages and Linguistics and head of MIT's Department of Linguistics and Philosophy. 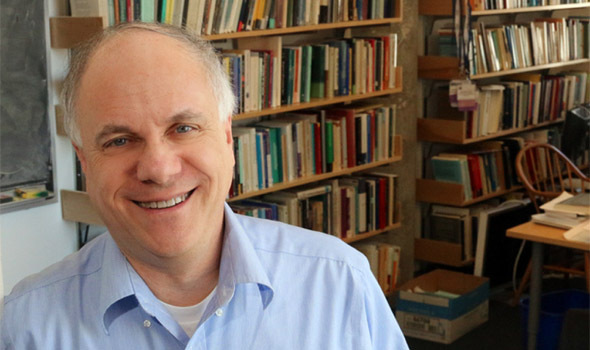 Pesetsky is noted both for his innovative and critical research on syntactic theory and for his teaching; he is a Margaret MacVicar Faculty Fellow at MIT, an honor awarded to the Institute's finest teachers and mentors. Planned in secret over a year and a half as a surprise to mark Pesetsky's 60th birthday, the event featured panel discussions on two linguistics topics of keen interest to Pesetsky — case and wh-questions — and was rounded out with poster sessions and a celebratory dinner. The event was organized by Claire Halpert (PhD ‘12), MIT Professor Sabine Iatridou (PhD ‘91), Hadas Kotek (PhD ‘14), and Coppe van Urk (PhD ‘15), with help from Mary Grenham, the administrative officer for MIT Linguistics. Iatridou offered welcoming remarks to start the day. "We're here to show you our love and appreciation," she said. "You have contributed to each and every one of us — with dedication and generosity and enormous linguistic talent — to our thinking, to our work, to our attitude toward doing science in general. Thank you." Planned in secret over a year and a half as a surprise to mark Pesetsky's 60th birthday, the event featured panel discussions on two linguistics topics of keen interest to Pesetsky — case and wh-questions — and was rounded out with poster sessions and a celebratory dinner. While it's unclear how Pesetsky was persuaded to pop into the Stata Center on a wintry gray Saturday, it's certain he was both genuinely surprised and delighted to discover the event had been planned in his honor. "Seeing over three decades of former students, from my very first PhD student from 1986 to students who just finished (and of course many who are still at MIT), all together in the same room — that was overwhelming," he said. "One of our alums who participated quoted her incredulous spouse as saying that 'we are in a special line of work if an all-day work conference on a Saturday counts as a really great birthday surprise.' But that's exactly how it was." A highlight of the day was the presentation of a Festschrift for Pesetsky — A Pesky Set: Papers for David Pesetsky — a collection of 60 linguistic papers contributed by former and current students. "If I understand correctly, it was apparently a magical accident that they numbered exactly 60," Pesetsky commented, "but it's no accident that the papers are fantastic, because their authors are some of the best researchers in the field today." Halpert, an assistant professor of linguistics at the University of Minnesota, co-edited the book with Kotek, a lecturer in semantics at Yale University, and van Urk, a lecturer in linguistics at Queen Mary University of London. 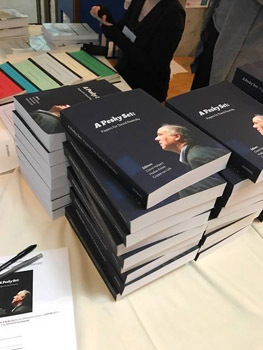 "Our aim with the Festschrift was to celebrate a part of David's legacy and impact on the field that is perhaps less immediately obvious just from looking at his own research output: the far-reaching effect of his tireless mentorship as a teacher and adviser," Halpert said. 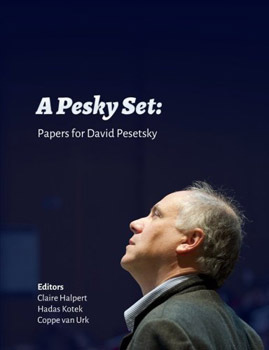 A highlight of the day was the presentation of a Festschrift for Pesetsky — A Pesky Set: Papers for David Pesetsky — a collection of 60 linguistic papers contributed by former and current students. Pesetsky is an "an inspiring teacher and dedicated mentor," said Kotek, noting that she continues to look to him as a role model now that she is a faculty member herself. "It can be hard to convey to someone just how much they've influenced your life, but I hope that this event is a good way for us to start saying 'thank you!'" Commenting in advance of the occasion, Institute Professor Emeritus Noam Chomsky, who led the department along with Institute Professor Emeritus Morris Halle during its early years, said the honor for Pesetsky is in some ways the fruition of the dream they had for the department. "Morris and I sometimes reminisce about the days, 60 years ago, when we mused about what it might be like to develop a linguistics program at MIT, quite a long shot at the time. Looking back over the years, it is immensely gratifying to see how the experiment took its course, and where it has reached today," Chomsky said. "It is particularly gratifying to know that the project is now in the very capable hands of David Pesetsky, one of the truly outstanding linguists of the current period, whose original and far-reaching achievements have been enriching the study of language and related disciplines since his student days." This volume celebrates David Pesetsky's career, and in particular, the profound impact he has had as a teacher and mentor to over three decades of linguists. The 60 submissions in this volume cover a wide range of syntax and syntax/semantics topics, as well as work on prosody, music, and even phonology. The papers employ diverse methodologies — including acquisition, computational, and experimental techniques — and focus on a rich and diverse set of languages — including Maya, Bantu, sign languages, Piraha, and, of course, Slavic. The festschrift is currently available through Amazon and will soon be available on the MITWPL online store site.